A normal conception involves the egg traveling through the fallopian tube where it meets a sperm and then moves onto the uterus where it attaches itself to the lining and develops over the course of 9 months. However, not all pregnancies follow this normal conception process and in some cases, the fertilized egg doesn’t travel to the uterus. It instead attaches itself to other abdominal organs, putting the life of the expectant mother in danger. Such pregnancies are called ectopic pregnancies and affect 1 in every 50 pregnant women. Ectopic pregnancies often occur within the first weeks of pregnancy when most women are unaware that they are pregnant. Read on to learn how you can deal with this condition and whether it affects your future pregnancies. Unusual bleeding. This bleeding is quite different from what you experience with normal periods and it may be brighter, watery or lighter and even darker than usual. Some women say that it resembles prune juice. Mild to severe pain on one side of the lower abdomen or the pelvis. This pain may appear suddenly or come gradually. You are advised to seek immediate medical attention. Pain with bowel movements and diarrhea. Shock. Sometimes the internal bleeding may cause shock and even lead to a collapse. Shoulder tip pain. If the bleeding is irritating internal organs like the diaphragm, shoulder tip pain may be experienced and this may get worse when lying down. If you are pregnant and begin experiencing any of the above symptoms, call your doctor. It’s important to realize that the sooner the condition is identified the faster it can be treated. 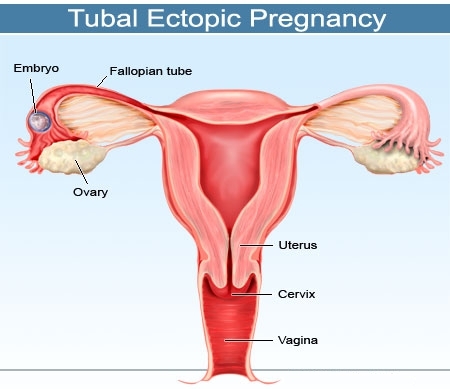 An ectopic pregnancy is caused by a fertilized egg’s failure to work its way to the uterus. This may be caused by an inflammation within the fallopian tube and this partially or entirely blocks the fallopian tube. PID, also known as Pelvic Inflammatory Disease, is a common cause of ectopic pregnancy and this inflammatory disease is caused by chlamydia or gonorrhea. Scar tissue from an abdominal surgery also could cause the blockage and lead to an ectopic pregnancy. Endometriosis is yet another cause and in very rare cases abnormal growths and birth defects alter the shape of the fallopian tube, disrupting the normal voyage of the egg. Women who have undergone corrective procedures on the fallopian tubes or tubal ligation which is a surgical sterilization procedure. In very rare cases, a woman can become pregnant after undergoing tubal ligation and in such cases the likelihood of developing an ectopic pregnancy rises to the range of 25-50%. If you had a previous ectopic pregnancy, your likelihood of developing a similar pregnancy is 1 in 10 and the risk factor increases when you undergo 2 or more ectopic pregnancies. Pelvic inflammatory disease (PID), which is an infection of the upper reproductive tract, could also be a cause. PID is brought about by STIs that are left untreated. Sometimes, the woman may not be aware that she has an STI. Infertility is more often than not as a result of damaged tubes and the likelihood of developing an ectopic pregnancy is much higher than average if you are undergoing treatment for infertility problems and get pregnant at the same time. The drug DES may be responsible and while this drug was banned in the U.S way back in 1971, it was still largely available in other countries. If your mother took the drug while expectant with you, it may be reason why you have abnormalities with your uterus and fallopian tubes. Endometriosis is a condition that scars the fallopian tubes and it can increase your risk of developing such a pregnancy. Age may be to be blame and women who are older than 35 years are at a higher risk of developing an ectopic pregnancy. Smoking also increases your likelihood of developing an ectopic pregnancy since it is believed that smoking impairs the normal function of the fallopian tubes. Studies also suggest that taking hormonal contraceptives with progestin-only and getting pregnant at the same time somehow increases your risk. If you think that you are at risk of developing an ectopic pregnancy, we recommend that you discuss your options with your doctor before you become pregnant. You can also protect yourself by steering clear of tobacco and STDs by using a condom. It’s important to detect an ectopic pregnancy early and your doctor will schedule an ultrasound to ensure that the pregnancy is a normal one. Your hormone levels also may be checked. Ectopic pregnancies are not preventable. However, you can reduce your risk by avoiding the risk factors. If you have had a previous ectopic pregnancy, you need to seek medical advice and examination before you conceive again. Ultrasounds and blood tests can help detect the condition early. When detected early, doctors will prescribe methotrexate which is a drug that halts cell growth and breaks up the existing cells. The doctor will then examine your blood for human chronic gonadotropin (HCG). If your HCG is still high, you might have to get another methotrexate injection. A laparoscopic surgery also may be used as treatment and this procedure is minimally invasive with a small incision being made in the navel or abdomen. The procedure is meant to repair the tube or take out the ectopic tissue. In cases where the fallopian tube is severely damaged, they may have to be removed as well. If there is heavy bleeding or a rapture of the fallopian tube, surgery will be undertaken using laparotomy. Does Ectopic Pregnancy Influence Future Pregnancies? It’s important to note that women who had a previous ectopic pregnancy can still have normal pregnancies. However, some will encounter difficulties with conceiving and this is common in women who had infertility issues before the ectopic pregnancy. Your risk factor increases with each ensuing ectopic pregnancy. An ectopic pregnancy can cause much emotional anguish and just like any other pregnancy the loss is real. It’s normal to grieve and you can get advice and support with organizations such as the Ectopic Pregnancy Foundation and the Ectopic Pregnancy Trust.